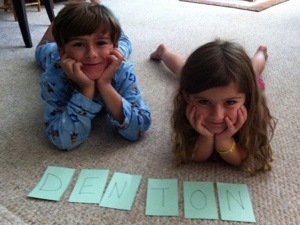 God continues to propel our family to Denton and is providing for us each step of the way. In fact, we are feeling his provision during this season in unique ways. His provision is like an engine driving us to Denton but also is building our faith. I have been reminded that his provisions are birthed from his character. I Corinthians 15:10 says, “But by the grace of God I am what I am, and his grace toward me was not in vain.” I’m a Christian, even a pastor, so I know in my head all about God’s grace, but the past couple of weeks I have deeply felt his grace toward me. I am what I am because of his grace, but continue to be changed by his unearned workings in my life. Baxter says that God’s glorification and God’s salvation/provision for his people are “not two decrees with God, but one decree, to glorify his mercy in their salvation.” God has been very merciful and gracious to our family, thus he is glorified. In the end, I am simply overwhelmed by his mercy and grace thus continue to grow in my faith and happiness in Him. God is providing for all our needs. Numerous details for the church plant continue to fall into place. The housing market in Denton is intense right now, especially for rent houses. We were initially discouraged but he provided us a rent house zoned for a good public school and the owners are believers who have been praying for believers to rent their house! We heard this morning that a spot just opened up in the second grade class at the local Christian school we have been researching! I took a chance to google your name and came across your website. I see you and your family are headed back to the homeland. I will be in prayer for you, your family, and the new church plant as your reach out to the pillions of people in South Denton. It was a pleasure service with you at C3. Look forward to seeing pictures of Mason in his tie.